New Delhi, February 27: Pakistani fighter jets on Wednesday reportedly violated Indian airspace in Nowshera sector of Rajouri and Poonch district, Jammu and Kashmir, said reports. The Pakistani jets were pushed back by Indian aircraft, senior officials said. A Pakistan Air Force (PAK) war jet F-16 was shot down by India, according to reports. Initial reports said that the Indian Air Force (IAF) confronted the Pakistani jets after they crossed over Line of Control (LoC) and pushed them back. Surgical Strike 2: Indian Air Force Strikes JeM Camps in Pakistan Days After Pulwama Attack, Pak Officials Cry Intrusion. 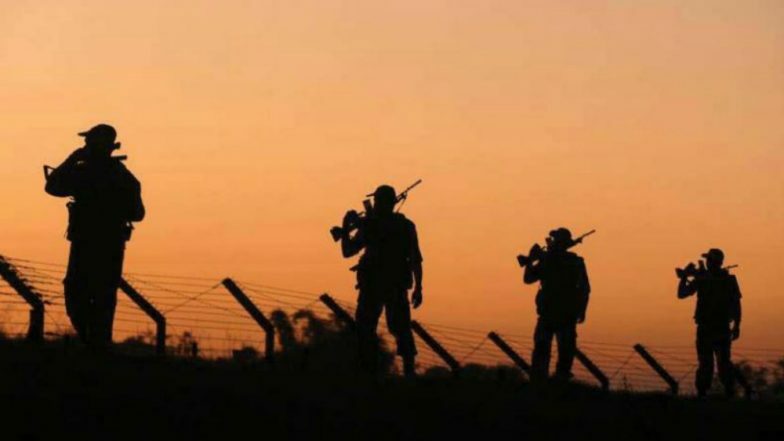 The news comes a day after the Indian Air Force (IAF) conducted raids on the Jaish-e-Mohammed (JeM) terror camps in Pakistan's Balakot, Muzaffarabad and Chakothi. As many as 12 Mirage 2000 jets took part in the operation that dropped 1000 Kg of bombs on terror camps across LOC, thus completely destroying it. The strikes are India's answer to the dastardly terror attack on the Indian CRPF jawans in which as many as 40 CRPF personnel were martyred and over a dozen seriously injured. India defended the IAF strikes on Balakot, Muzaffarabad, and Chakothi and said that it was not a military operation but a preemptive measure to prevent another attack on Indian soil by the Jaish-e-Mohammed (JeM). India Foreign Secretary Vijay Gokhale said after the Indian Air Force operation that it does not wish to escalate the tensions further as the IAF strikes were not a military strike nor aimed at civilians in Pakistan. Gokhale in his press briefings also confirmed that a major JeM terror camp was destroyed. Pakistan, on the other hand, had called India's action as "an act of aggression by India" and said that India's action will have "severe repercussions for the regional peace and security".